New iPad as thin as a pencil, and as light as a pad of paper. On November 2, Apple hopes to once again revolutionize the tablet market with the iPad mini, the newest addition to the company's formidable product line. Designed to fit in a person's hand, the device weighs just .68 pounds and is 7.2mm thin, making it 53 percent lighter and 23 percent thinner than the current iPad. In addition, the iPad mini features an impressive 7.9-inch display (for comparison, iPad 2's screen is 9.7 inches) at a resolution of 1024 x 768, which allows for FaceTime HD calls and crisp images. There's also a five-megapixel iSight camera on the back that can record video in 1080p. Internally, the iPad mini has an A5 dual core chip, along with Apple's largest and thinnest single cell battery that provides 10-hours of battery life. The tablet supports Ultrafast Wireless LTE, along with 802.11 a/b/g/n Wi-Fi. These recyclable components are environmentally friendly, while the display is made from arsenic free glass. Available for pre-order October 26 in either black or white (slate back), the iPad mini comes in multiple configurations, depending on how much memory you want, as well as Wi-Fi versus Cellular. The base Wi-Fi unit will retail for $329 and come with 16GB; other versions include $429 (32GB) and $529 (64GB). As for Wi-Fi plus Data models shipping roughly two weeks later, you can choose from $459 (16GB), $559 (32GB) and $659 (64GB). If, conversely, you prefer the larger tablet, Apple also revealed the fourth generation iPad, which appears to be a slightly tweaked version of the current model. It includes an A6X chip for double the CPU performance, FaceTime HD at 720p, two times faster Wi-Fi, expanded LTE coverage, and the praised Retina Display. For Wi-Fi, you'll pay $499 (16GB), $599 (32GB) and $699 (64GB), while Wi-Fi plus Data will cost $629 (16GB), $729 (32GB) and $829 (64GB). Please note that both the iPad mini and the fourth generation iPad work with Apple's new Lightning connector, the same as with iPhone 5. 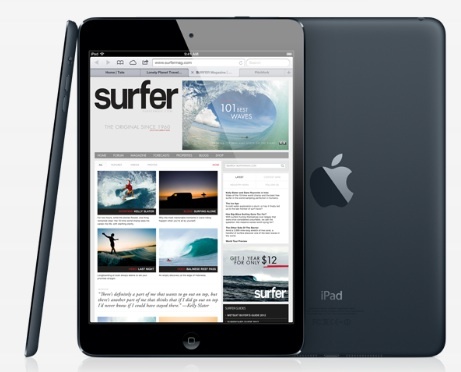 Finally, the iPad 2 will sell for $399 (16GB, Wi-Fi) and $529 (16GB, Wi-Fi plus Cellular).